Just announced a few days ago, and on sale today are a pair of London dates for renowned American guitarist, singer and composer Ry Cooder - the man behind 1997's highly acclaimed 'Buena Vista Social Club' album. 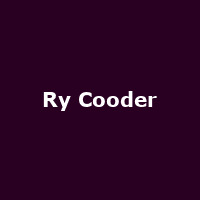 Ry Cooder will be joined on the nights by English singer, songwriter and musician (and former band-mate) Nick Lowe - the songwriter behind 'Cruel to be Kind' and '(What's So Funny 'Bout) Peace, Love, and Understanding' (later covered by Elvis Costello - produced by Nick and later covered by Curtis Stigers). The tour will mark almost twenty years since Nick has been on the road. Also playing on the night will be Flaco Jiménez - a renowned Tejano accordion player from Texas and Cooder's son Joaquin. The London dates are at the Theatre Royal on Drury Lane on 5th July and the Lyceum Theatre the following night - tickets start from £50 + booking. The guys are also playing three dates at the Olympia theatre in Dublin in June from 10th to 12th June before heading to Belfast on 14th June, then London and dates at the Edinburgh Festival Theatre on 9th and 10th July.